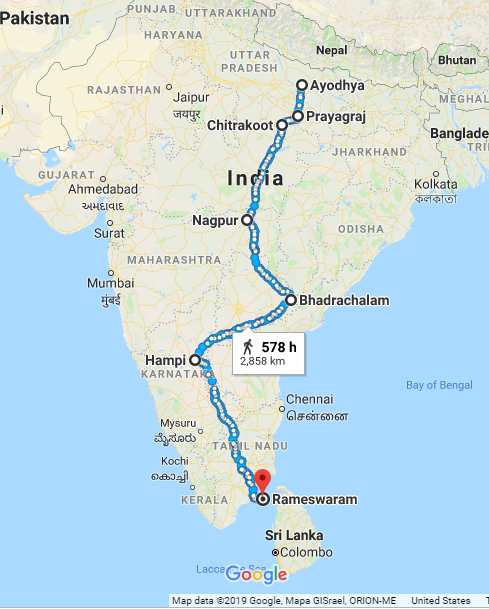 I would like to know if we can trace a path of Lord Rama's exile journey from Ayodhya to Sri Lanka. The towns he visited on his route. Prominent stop overs, like Shabari visit, deer hunting location, Vaali, Sughriva. In the answer expecting towns of India to trace the path. Here is what I have gathered about the route of Lord Rama to Sri Lanka during his fourteen years of exile. Ayodhya: The origin, this is where it all started, the pad yatra for exile. Prayagraj or Allahabad: This is the place where three rivers meet Ganga, Yamuna and mythic Saraswati, hence Triveni Sangam. Chitrakoot:This is the place he planned to put up his tent and settle for next fourteen years. Dandakaranya: Since Mata Sita was abducted in Chitrakoot he went looking for her in this area, which spans across various states. It is in these forests that Rama and Lakshmana met Shabari, exact location unknown. 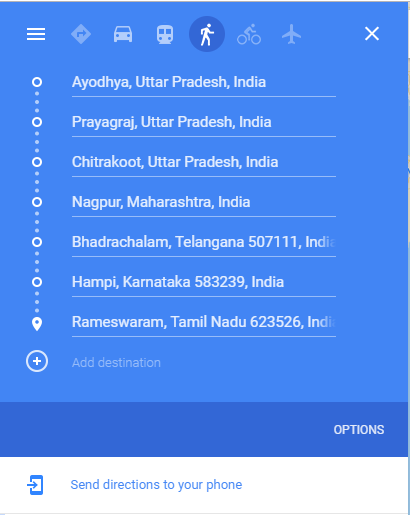 The other stops were Nagpur, Maharastra and Bhadrachalam, Telangana. Hampi: This is where Rama meets Sugreeva and vanara sena and heads to Sri Lanka. Rameswaram: Crossing the Ram Setu, the vanaras build the stone bridge by placing the rocks. Sri Lanka: Final destination to meet with Sita. Not the answer you're looking for? Browse other questions tagged ramayana . What is the story of Lord Rama's departure? What is the reason behind Lord Rama's disappearance?